Death of me? Yes, as in: “This project is going to be.” Although I think it’s very likely that today’s entry represents the absolute nadir of this endeavor. From here, it can only get better. Unlike the other Japanese Kit-Kat bars I’ve been writing about, there’s nothing particularly exotic about this one. I don’t think I’ve ever seen one exactly like it on sale in the U.S., but I’ve never really looked, and in any case it conceptual components are certainly widely available here. And I scrupulously avoid them! But here they are, combined in a single offensive package. The villain of this piece? 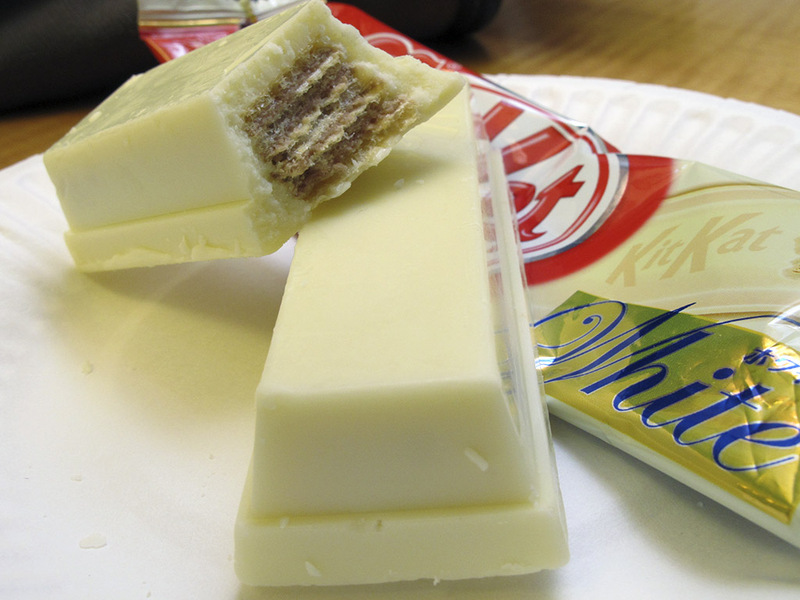 A Kit-Kat White Bar, aka a white chocolate Kit-Kat Chunky. It’s similar to the banana bar from a few days ago, except without even the promise of a slightly unusual flavor to spruce it up. It’s just… an oversized Kit-Kat covered in thick white chocolate. But it was donated to the Kit-Kat Densetsu cause by David Ellis the last time he went to Japan, and he contributed it in good faith! So I was determined to do my part and choke it down. Photo tragically taken by Jeremy. Crivvins! Look at that thing. You could kill someone by shoving it through their skull. It dwarfs the paper plate it was photographed on! Needless to say, this was not good. At all. All the issues that beset the banana bar are present here — the chocolate shell is way too thick, and since it’s white chocolate, that means suffering through endless waxy mouthfuls of overly sweet cocoa solids and assorted sweeteners. The interior is totally decent, but it’s completely overwhelmed by the awful white chocolate-y-ness of the outer portions. I felt nauseous all yesterday afternoon, and I’m pretty sure I know where to point the finger of blame. I actually don’t hate white chocolate as much as most people; it’s interesting in moderation. It’s delicious when it shares room and board with macadamia nuts in a cookie! But this is not moderation, it is a violation of human rights. I intend to file a complaint. Actually, I guess that’s what this post is. Like I said, it’s all uphill from here, in a good way. But first, maybe I will write about something that’s not Kit-Kat for a while. I need a break, because this one broke me. Am I so strange in that I love White Chocolate? I often (probably more often then I should!) buy a cake of White Kit-Kat and nibble at it for about a week. Oh Jeremy, just open your heart to a simpler pallet.